Back in April, for about a week, Motorola had a deal allowing US customers to buy the high-end Moto Z2 Force (pictured above) for $500 - $220 off its original price. We're glad to inform you that, as of yesterday, the deal is once again available, alongside deals on a couple of other Motorola smartphones. 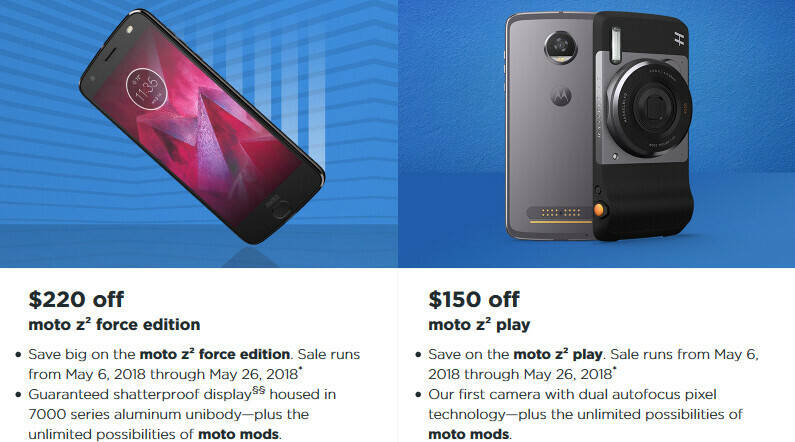 Besides buying a Moto Z2 Force at $220 off, you can save $150 on the Moto Z2 Play (currently sold for $349.99 instead of $499.99), and $100 on the Moto X4 (sold for $299.99 instead of $399.99). Motorola says these price cuts will be valid until May 26, or while supplies last. Of course, none of these three Moto handsets are new, as they've been around since last year. Nevertheless, they currently represent the best that Motorola has to offer in the high-end and mid-range classes. A Motorola Moto Z3 series should be released sometime this year, but probably not earlier than August. A Moto X5 may also be introduced at some point, though likely towards the end of 2018. As for the recently announced Moto G6 and E5, these are not available to buy yet, and they're entry-level phones anyway. Why can't Motorola bring those devices to Canada. They only sold the Moto Z2 play in Canada. While supplies last??? Maybe we might be getting the Z3 early them excepted??? A Moto X5 at the end of the year 2018 impossible,they themselves cancel the product line.Let wait and see till that time. Cut the 2017 price off 15-20% is not a sale-off in any means in mid 2018. It's just a price adjustment.